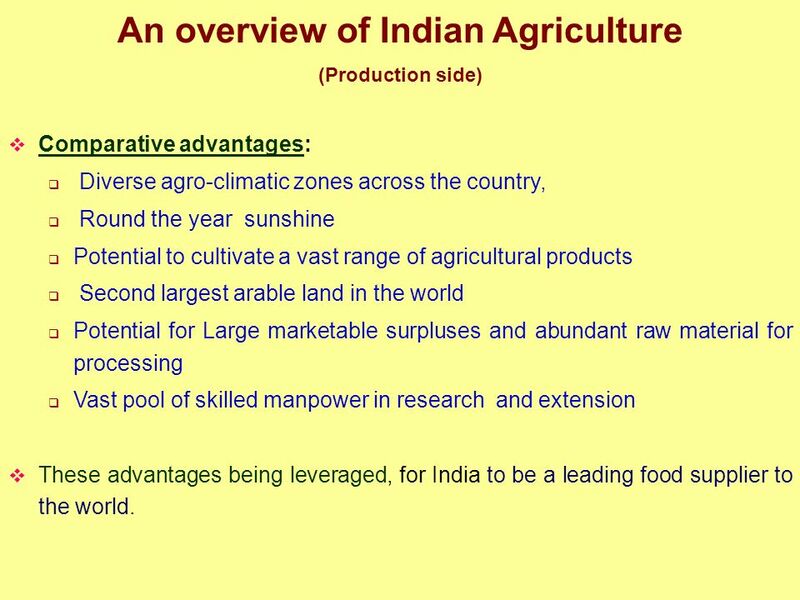 (Production side) Comparative advantages: Diverse agro-climatic zones across the country, Round the year sunshine Potential to cultivate a vast range of agricultural products Second largest arable land in the world Potential for Large marketable surpluses and abundant raw material for processing Vast pool of skilled manpower in research and extension These advantages being leveraged, for India to be a leading food supplier to the world. 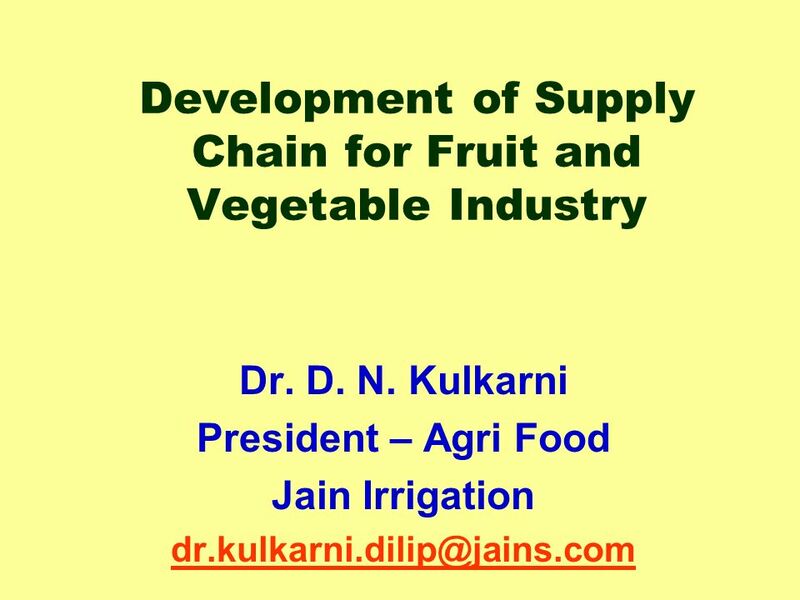 Steady increase in global production of fresh produce. 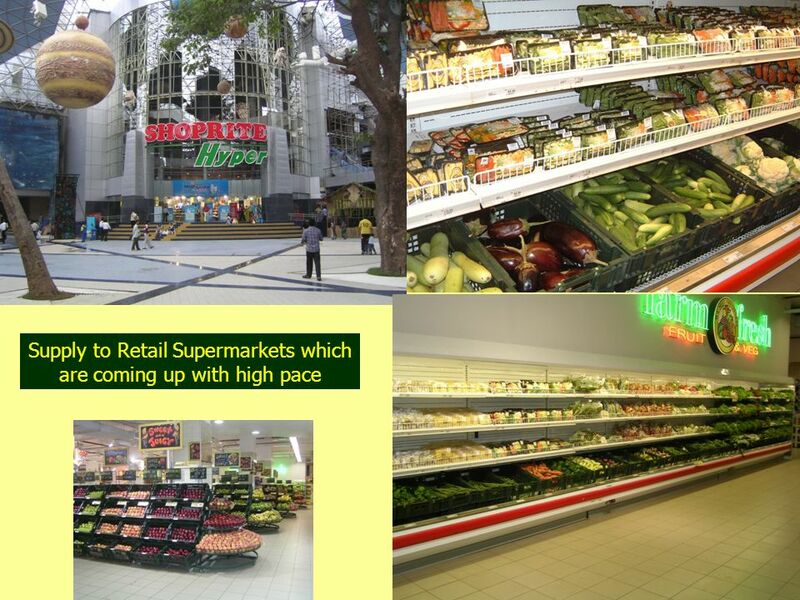 Balance of power shifting to retail chains from suppliers Food safety standards are higher & more complex requirements. Demanding regulations Increasing intensity of technology Consumption is convenience-driven. i.e. 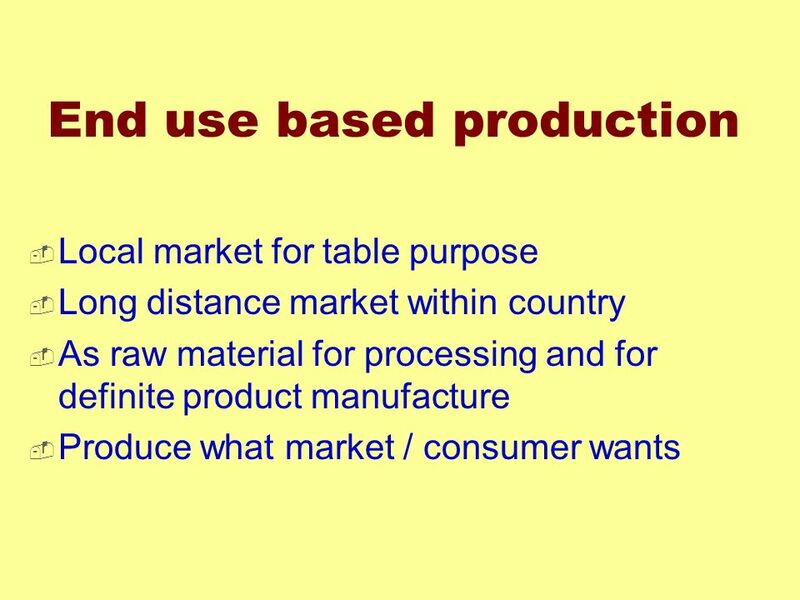 Value added products. 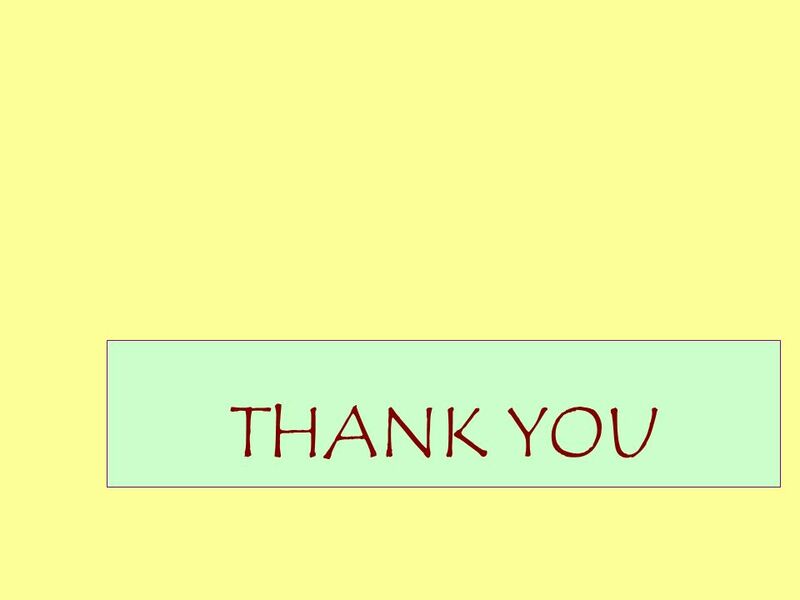 Increasing health concerns reflected in food consummations. - Organic, functional, herbal. 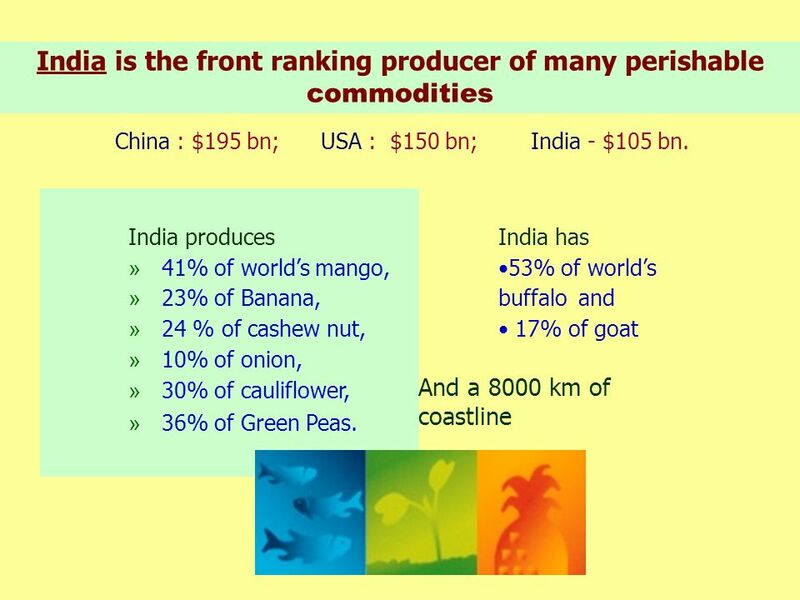 Grapes : India produces approx. 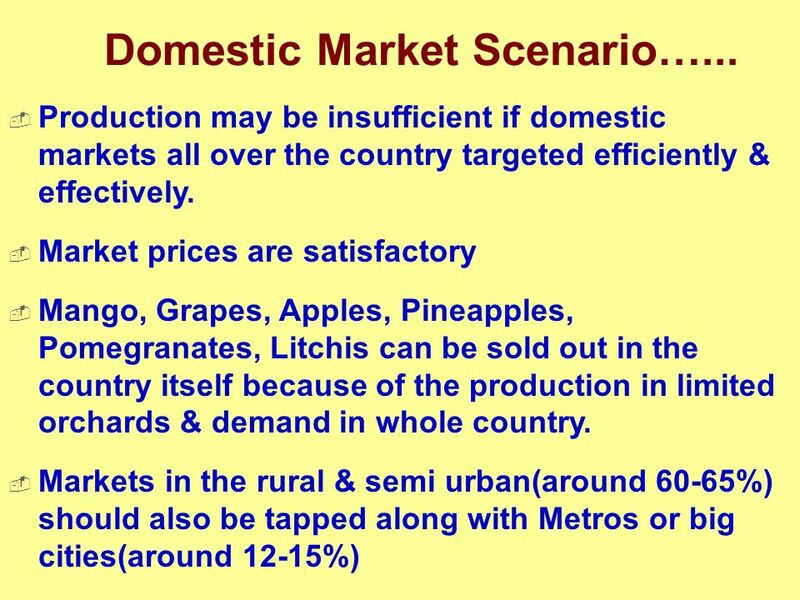 1 million tons of fresh grapes annually, out of which export of grapes is about 14000 tons per year, which accounts for only 1.4% of the total production. 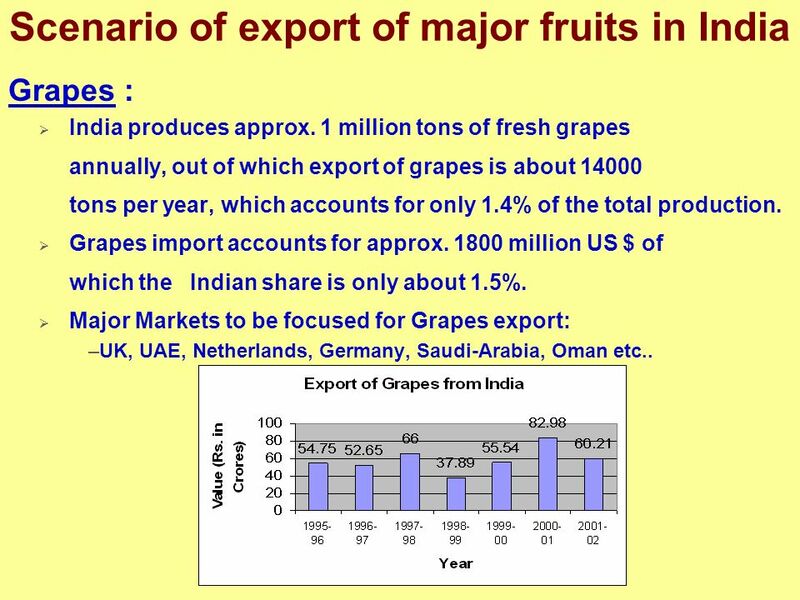 Grapes import accounts for approx million US $ of which the Indian share is only about 1.5%. 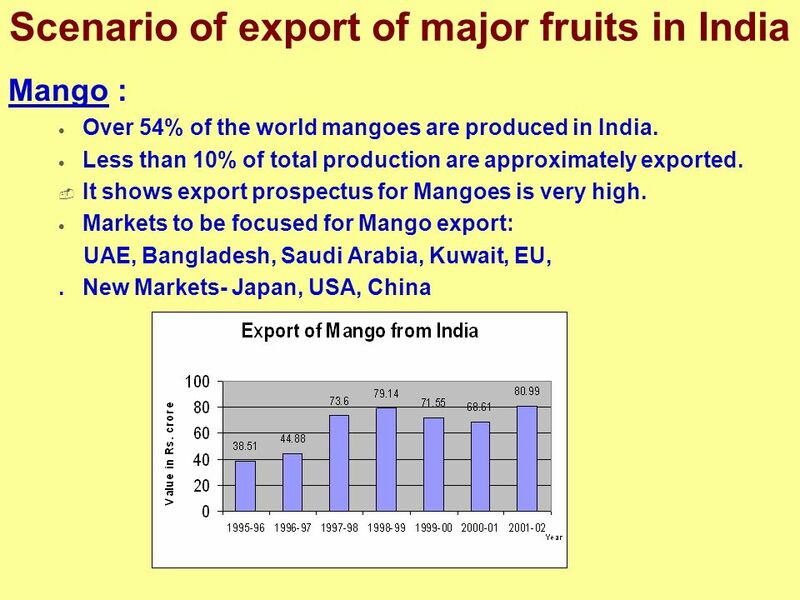 Major Markets to be focused for Grapes export: UK, UAE, Netherlands, Germany, Saudi-Arabia, Oman etc..
Banana : First in production of Banana in the world. (Around 22% of world’s total output). 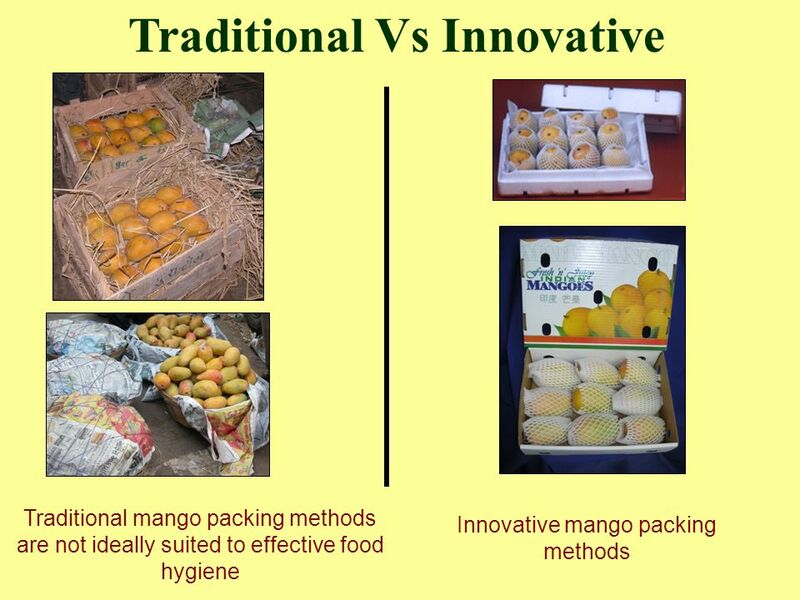 However, the export from India is negligible. 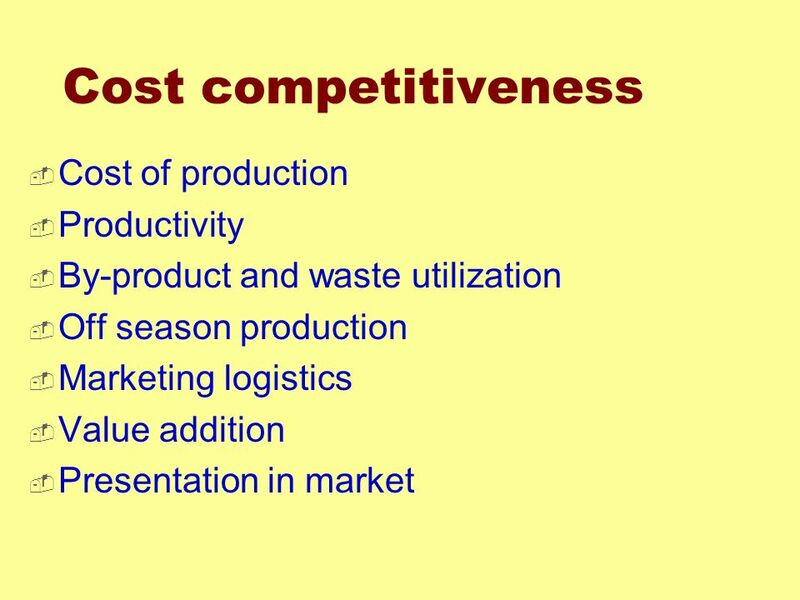 Reasons: Non availability of on-farm packing house, precooling and cold storage facilities. Improper pre-harvest practices. Improper post harvest handling. 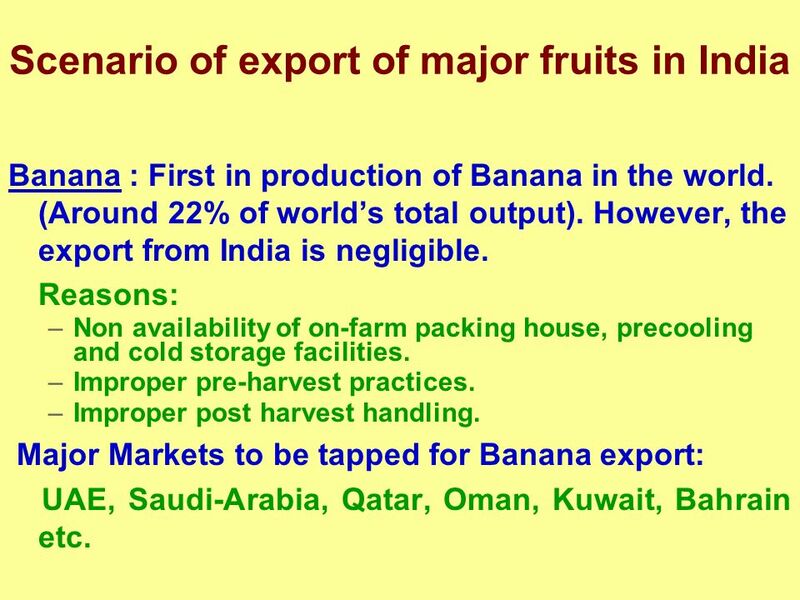 Major Markets to be tapped for Banana export: UAE, Saudi-Arabia, Qatar, Oman, Kuwait, Bahrain etc. 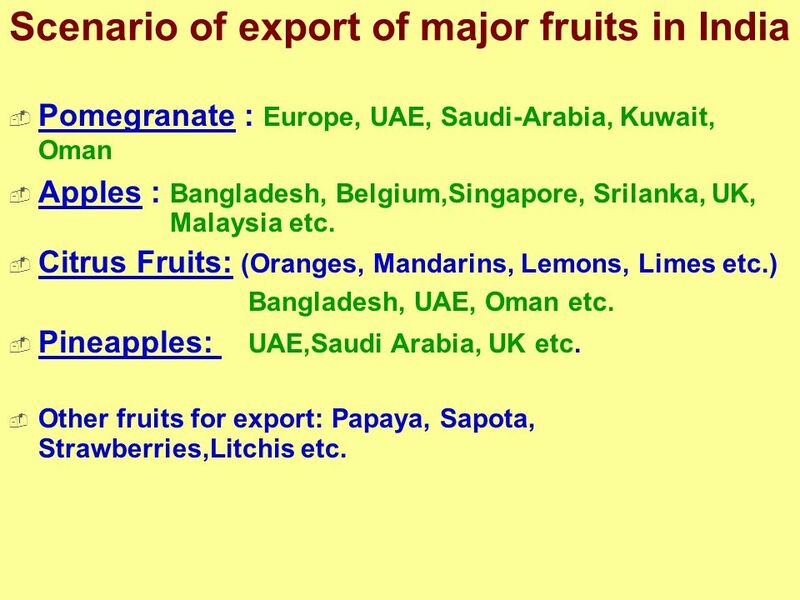 Pomegranate : Europe, UAE, Saudi-Arabia, Kuwait, Oman Apples : Bangladesh, Belgium,Singapore, Srilanka, UK, Malaysia etc. 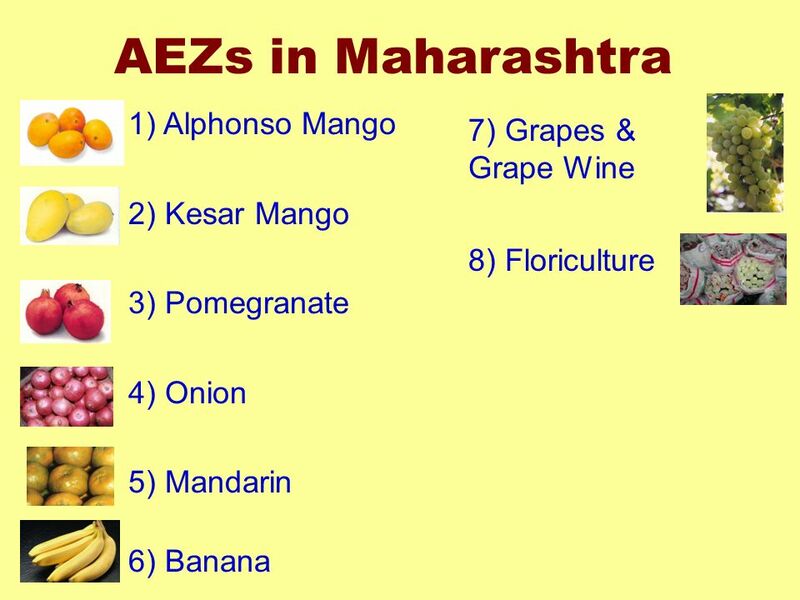 Citrus Fruits: (Oranges, Mandarins, Lemons, Limes etc.) Bangladesh, UAE, Oman etc. Pineapples: UAE,Saudi Arabia, UK etc. 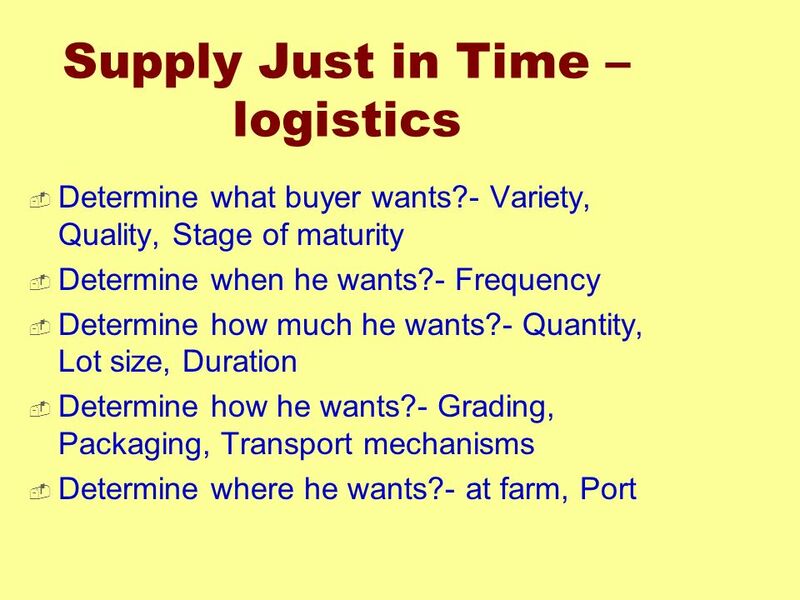 Other fruits for export: Papaya, Sapota, Strawberries,Litchis etc. 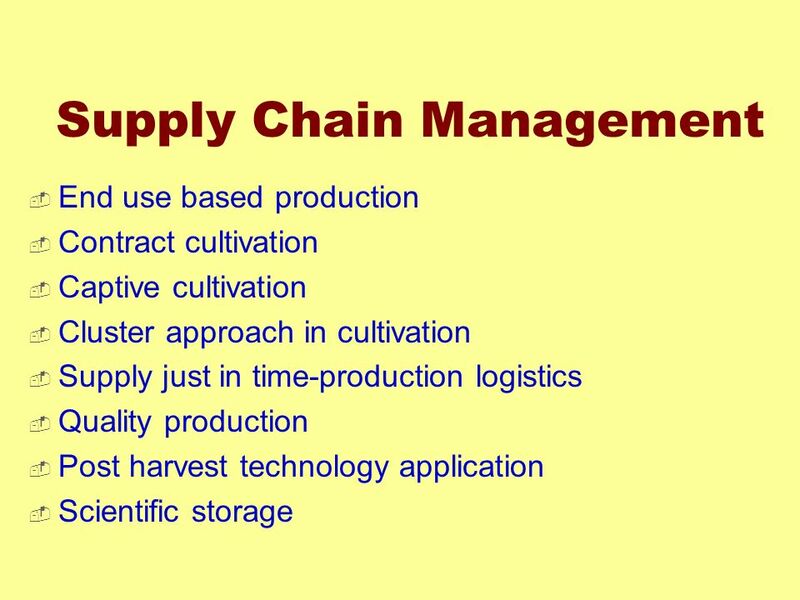 Download ppt "Development of Supply Chain for Fruit and Vegetable Industry"
Post-harvest Losses, Technology, and Value Addition Rosa Rolle Senior Agro-Industries and Post- harvest Officer. 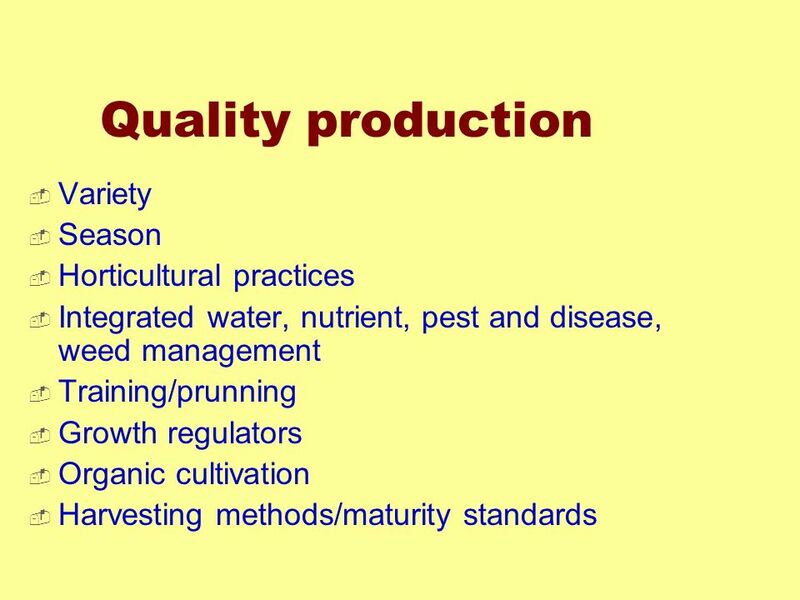 Ministry of Agriculture Republic of Somaliland Hon. Minister Farah Elmi Mahmoud Minister for Agriculture Republic of Somaliland 14 October, 2014 I NVESTING. 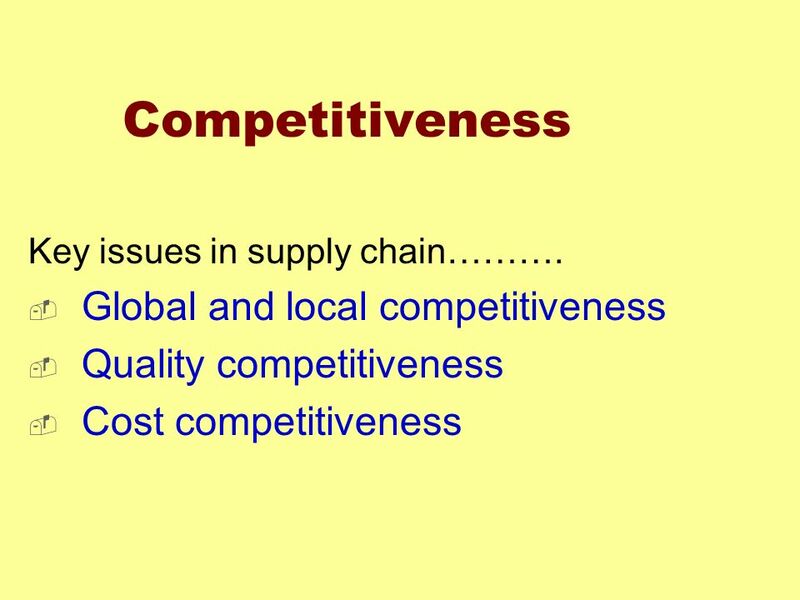 Department of Economics Bapatla College of Arts & Science Indian Agriculture – An Overview. 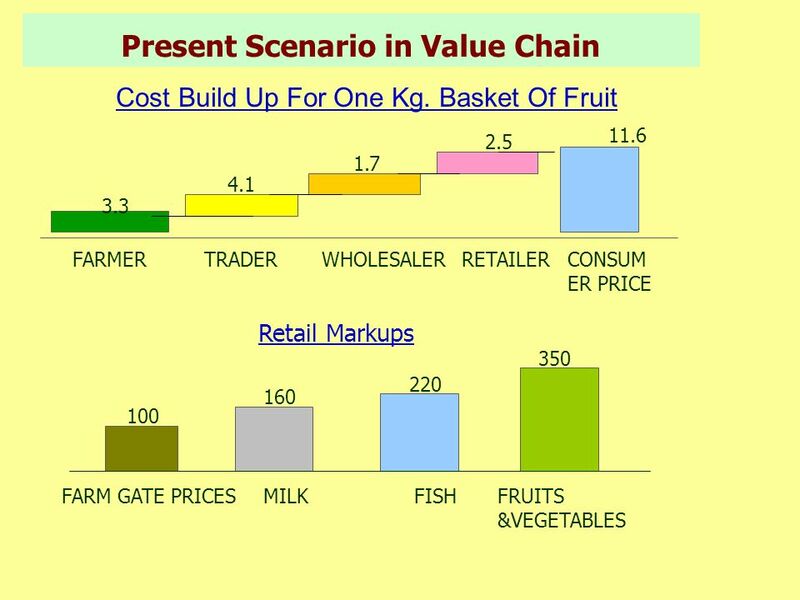 May 2, 2015 Developing Integrated Supply Chains Sanjeev Asthana “ Better Returns for the Indian Farmer and producer by connecting them directly to the. 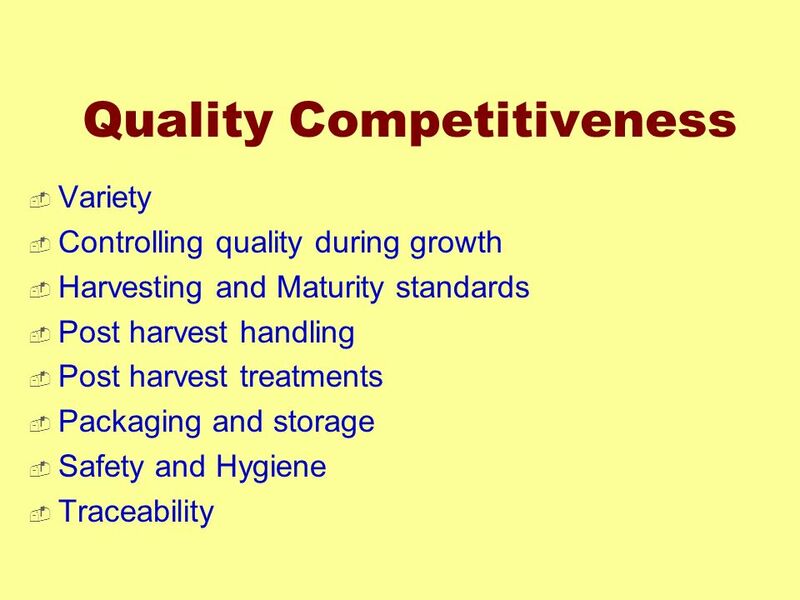 Agribusiness in Pakistan Opportunities for Investment. 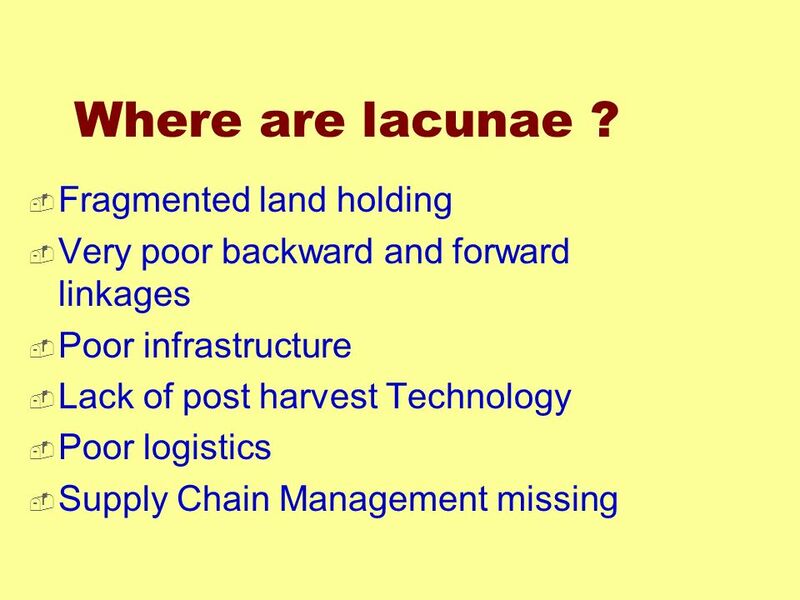 Food Waste and Food Loss: a BIG Horticulture Concern in Africa Dr Stephen Mbithi CEO: FPEAK- Fresh Produce Exporters Association of Kenya Coordinating. 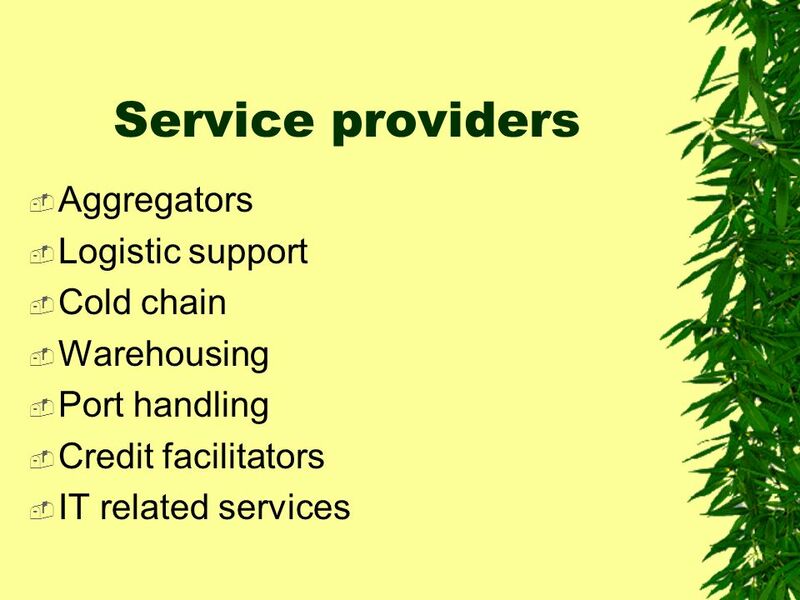 China agriculture: customer or competitor? Allan Rae. The case of Zimbabwe. 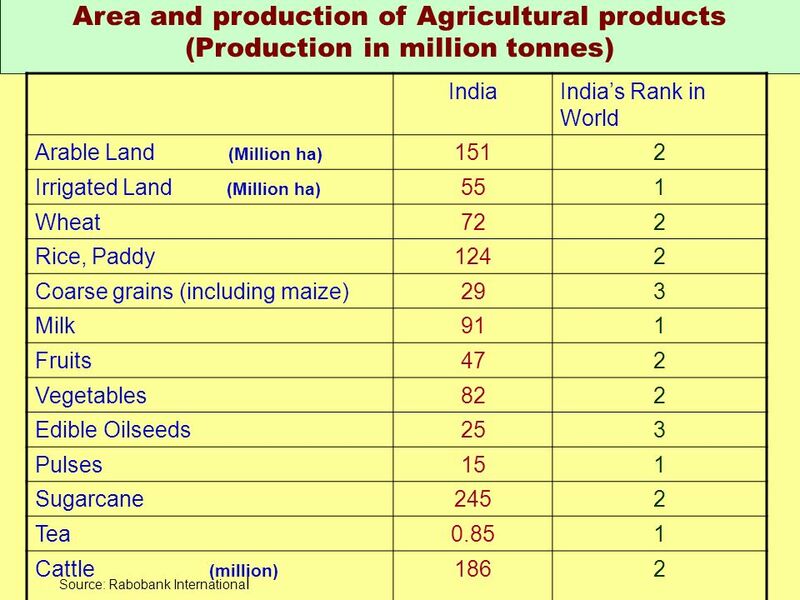  Massive production of all agricultural commodities to ensure national food security and household food self sufficiency. 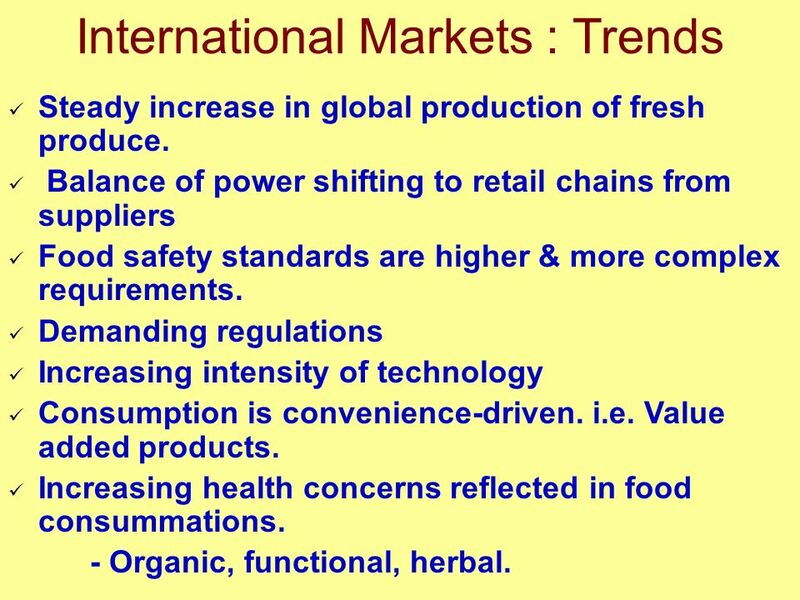 GLOBAL PRODUCTION AND MARKET TREND OF TROPICAL FRUITS Dr. Izham Ahmad Chief Executive Officer International Tropical Fruits Network (TFNet) Walk-In Seminar. 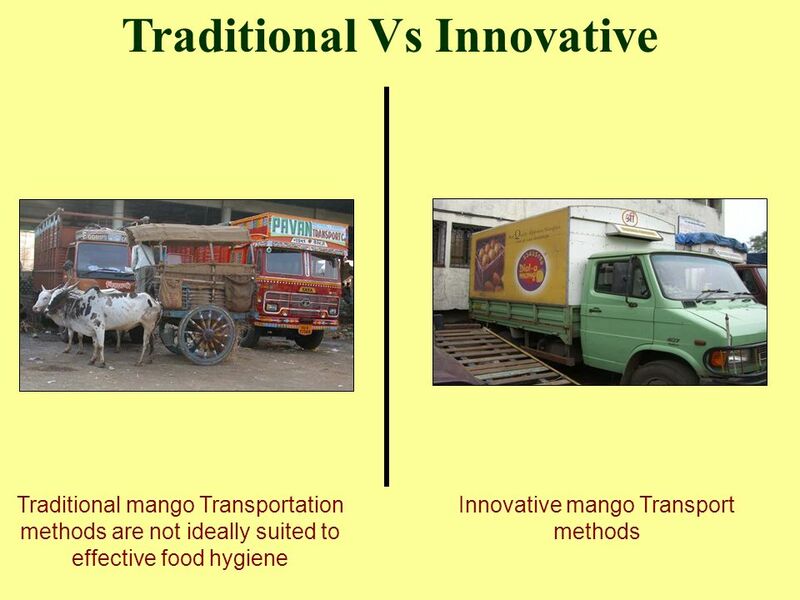 Congruence of Technologies for Rural Prosperity Mruthyunjaya Director National Centre for Agricultural Economics and Policy Research, New Delhi. Panel 9: Building Food Security Thursday, April 20 th (12:45-1:45pm) 13 th Symposium on Development and Social Transformation. © CommNet 2013 Education Phase 3 Food production – farm to fork.